Harry Bertoia (1915-1978) was one of the most complete and extraordinary artists that the world has ever seen. After finishing his studies at the Detroit School of Arts and Crafts, Bertoia opened his own metal workshop in Cranbrook, where he taught jewellery design and metal work. Leter, in 1946 he moved to California to help Charles Eames developing methods of laminating and bending plywood. His contribution and influence was definitely crucial for the creation of the famous Eames chairs. 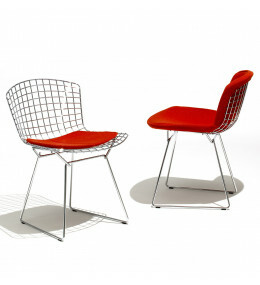 Bertoia was extremely instrumental in achieving the flexible plywood seat with tubular frame that eventually became the Eames chair. It was known only as the Eames chair and there was no mention of Bertoia or the other co-workers. Frustrated by the lack of recognition, Bertoia left Eames and was summoned to join the Point Loma New Atomics Laboratory. Part of his work at the lab was to scrutinize the human body and chart how to design equipment such as control panels and knobs with respect to comfort of the human reach and grip. He found this study of body dynamics (today we might call it ergonomics) fascinating and it contributed to knowledge used later in designing well-fitting practical chairs. Among his fellow art school colleagues, Harry Bertoia had a really good reputation. Everyone knew how phenomenal his work was and so on the suggestion of Herbert Matter, who had worked alongside Eames and Bertoia, Florence and Hans Knoll traveled to California aiming to convince him to move east and set up his own metal shop in a corner of Knoll’s production facility. Having studied with Bertoia at Cranbrook, Florence was sure that he would produce something extraordinary if given the time and space to experiment. The designer and sculptor was indecisive and it was his wife Brigitta who decided saying “yes” for him. 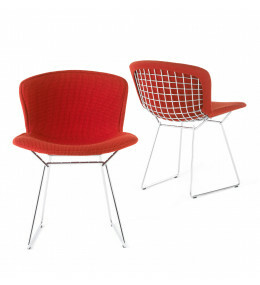 Bertoia was promised, and indeed received, complete credit for all designs he created with Knoll. 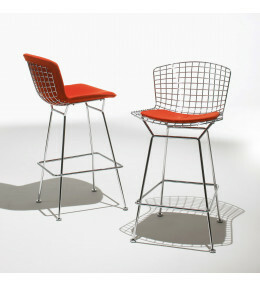 Bertoia Barstools can be upholstered or come with a replaceable seat cushion and back pad.